Springtime is bursting into all of her glory in my neck of the woods. The grass is a lush, velvety carpet that seems to be the most brilliant green that I have ever seen. The gray trees are bursting at the tips, transforming from a dull stick-like figure into a flower-filled spectacle that dances in the sunlight. Birds are chirping, chattering and singing in what seems like a symphony of sound to my ears. And the magnolias…the magnificent magnolias are as spectacular as I can ever remember. As I hurriedly jumped into the car the other morning to drive my daughter to school, my heart was heavy with grief and my mind felt numb. Trying to digest the news and all of the horrific things that happen in the world these days can be overwhelming. I rolled down the windows as I drove and soon realized that all of the loud thoughts swirling in my mind had been silenced by the sound of birds singing. As I turned back into my driveway I happened to glance at my side yard and noticed that overnight, my lush green grass, had turned into a sea of purple. 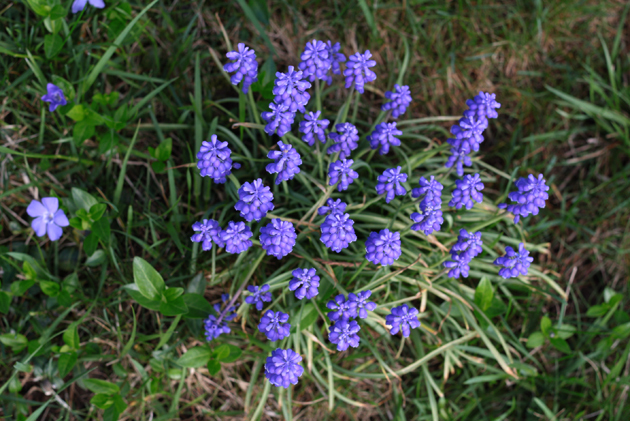 Hundreds of tiny, purple Grape Hyacinths had popped up out of the ground transforming my yard into what looked like an enchanted forest of flowers fit for fairies. An enormous wash of emotion swept over me and I felt like a little girl again. I was suddenly filled with wonder and excitement, wrapped in anticipation of this new glorious day. I soon found myself on my hands and knees, in my pajamas, carefully picking handfuls of the smooth, cold stemmed Grape Hyacinths still wet with dew. I had always adored these tiny little spring flowers as a girl and remembered filling the small paper Dixie cups with them for my mom to display on the windowsill in the kitchen. My two little girls had done the very same thing for me but it’s been years since they’ve relished in such things. Once my hands where full of flowers I galloped inside with my treasures. I clamored through my kitchen cabinets and found these sweet vintage creamers that I had gathered while antiquing. They where a perfect fit (almost as good as the Dixie cups) and I happily filled them as my heart simultaneously filled with joy. My kitchen transformed into a safe haven of delicious memories and my mind felt at ease. This week I found Spring and all the hope she holds. Spring always seems to make my heart burst into joy but this year it just seems different, more vivid and vibrant, and I’m not sure why. It’s almost as if God knows that we all need to be reminded of hope and joy and innocence in the midst of all the ugly in the world. Beautiful, joyful, hope that can turn any dull, seemingly dead earth into a brilliant, bountiful, flower-filled spectacle of color and life. And that’s exactly what I found. I hope that you can too. Gloriously beautiful!! Thank you for sharing, and Thank You, Father God for giving us these flowers to comfort us! Wendy, you have such an extraordinary way with words and photos that transports my mind to such a beautiful place! What a gift you were blessed with! LOVE this post!!! I found myself outside after dark with my lantern in hand to pick these fabulous wonders.Wondering what these little beauties were I came across your path.What a lovely way you describe the hope and joy we have in God even through His signatures.